A sheen of oil has been spotted three miles downriver after a barge carrying 80,000 gallons of crude oil hit a bridge. NBC's Brian Williams reports. A barge carrying 80,000 gallons of oil hit a railroad bridge in Vicksburg, Miss., on Sunday, spilling light crude into the Mississippi River and closing the waterway for eight miles in each direction, the Coast Guard said. A second barge was damaged. 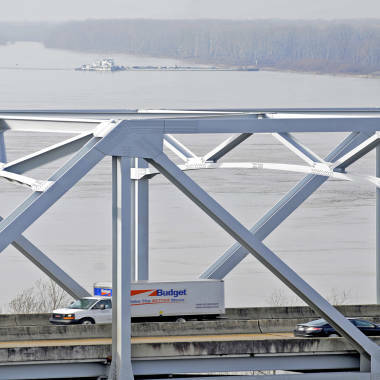 The towboat Nature Way Endeavor banks a barge against the western bank of the Mississippi River on Sunday as vehicles travel on the Interstate 20 bridge. Investigators did not know how much had spilled, but an oily sheen was reported as far as three miles downriver of Vicksburg after the 1:12 a.m. (2:12 a.m. ET) incident, said Lt. Ryan Gomez of the Coast Guard's office in Memphis, Tenn. Authorities were still trying to determine the source of the leak, but it appeared to be coming from one or two tanks located at the stern of the first barge, Gomez said. He said there was no indication that any oil was leaking from the second vessel, and said it was still unclear whether the second barge also hit the bridge or was damaged through a collision with the first. "Investigators are still trying to figure out what happened," he said. United States Environmental Services, a response-and-remediation company, was working to contain the oil with booms before collecting it and transferring it to one of the barge's undamaged tanks, then ultimately to a separate barge, Gomez said. He could not say how long the river would remain closed in the area. Five northbound and two southbound vessels were waiting to pass, he said. "It's still considered an active leak," Gomez said. "We don't have an estimate or accurate amount of what was released." Railroad traffic was allowed to continue after the bridge was found safe for trains, Petty Officer Carlos Vega said. The last time an oil spill closed a portion of the lower Mississippi River, it was for less than a day last February after an oil barge and a construction barge collided, spilling less than 10,000 gallons of oil. In 2008, a fuel barge collided with a tanker and broke in half, dumping 283,000 gallons of heavy crude into the waterway, and closing the river for six days. The oil sheen from Sunday's incident was unlikely to pose a threat to the Gulf of Mexico, located 344 river miles south of Vicksburg. Residents and businesses in Gulf Coast states are still recovering from the April 2010 explosion of the Deepwater Horizon drilling rig, which killed 11 workers and spewed more than 200 million gallons of oil into the Gulf. Associated Press Writer Lisa J. Adams contributed to this report.